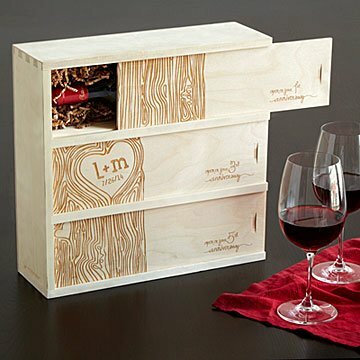 This personalized wine box houses three bottles to be opened on a couple's 1st, 3rd and 5th anniversaries. Great wines and great relationships improve with each passing year. And this customized anniversary wine box offers a personal way for one to toast the other! The box has three separate compartments for wine (not included), to be opened and enjoyed on the couple's anniversary. Engraved along the front with a flowing faux bois tree trunk, personalized with the "carved" initials of the happy pair, and the words "love" and "adore" hidden in the tree bark. The box is made from unfinished birch and aspen wood in Kirkwood, Missouri. Option 1: Heart Your choice of initials and date will be custom-engraved in the heart. On the right side of the three sliding panels, there is the invitation to "Open on" the recipients' 1st, 3rd and 5th anniversaries. (The traditional gift for a fifth anniversary is wood!) Inside, each panel is engraved with a special, wine-themed toast to the couple. Option 2: Heart + "Open on" In addition to the heart, you can customize the anniversary years marked on the right side of the three panels, making it a gift for any vintage of marriage. You pick which three years your bottles will be opened on and enjoyed by the happy couple. The toasts are included on the back of each panel. "I hope your love today shines are bright as it did on your wedding day. Love, Bruce and Tammy." "With each sip of this wine, I want you to share one happy memory together or one thing you love about the other person." This came and it was even more beautiful than I expected. The wood etching was clean and gorgeous. It even came with the stuffing for each compartment - a bonus I did not expect! The couple loved it, and I was so proud to give it as a gift to them on their wedding day. Thank you! Love this! Made with quality, a fun and unique gift. Lovely memento of a great event, and wines can be any price... Because there were six of us, we got really outstanding wines. We bet that these friends will remember us all every time they open a bottle. Extremely high quality - gift worthy! Received as a gift, and loved it!!! My husband and I received this product as a gift for our wedding, and we were very surprised and delighted! It is such a thoughtful gift that we will enjoy for the next 5 years. Our local wine shop loved it!!! My best friend had a beautiful garden wedding and this was a perfect person gift to remember the day. Our recently married friends received this gift and immediately reached out to us saying it was the most thoughtful gift they had received. The quality of the work is superior and the options for a personal touch are fantastic: we had the couple's vows inscribed in the box. The box arrives unstained. The couple plans to stain it.